I had heard the Seventeen Stay Time Foundation mentioned a few times lately with mainly positive reviews so after hunting it down (it seemed to be out of stock in most Boots I went to!) I have been giving it a go for myself this past week or so. Whilst picking up the foundation I saw there was an offer on meaning I caved and got the Stay Time Primer too... it only felt right to test them out together! 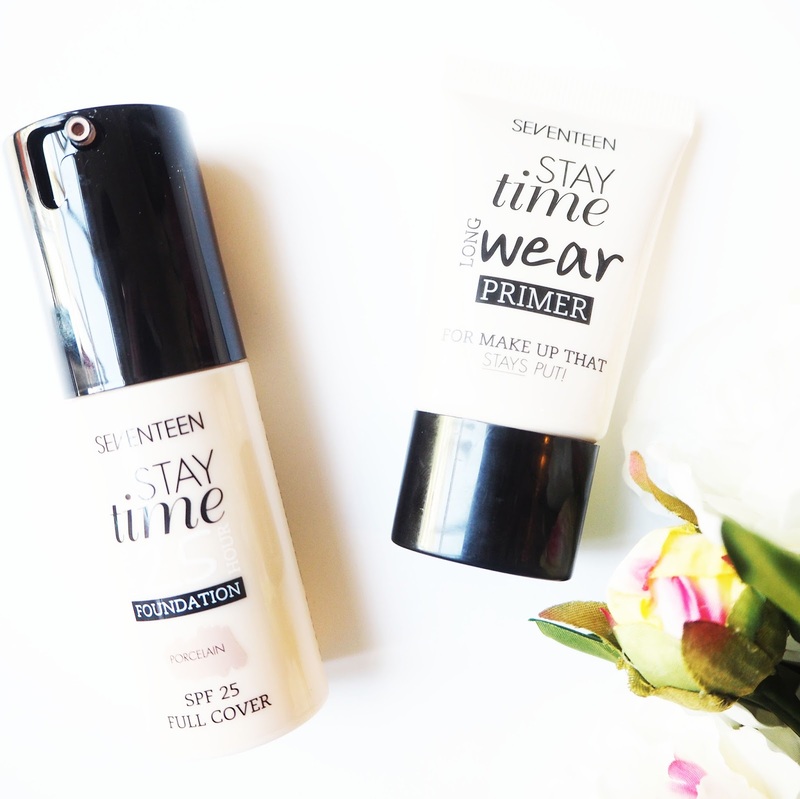 The Stay Time Long Wear Primer (£5.49) is something I am struggling to make my mind up on after using it several times. There wasn't a tester in the shop so I just had to go with it, if there had have been a tester I don't think I would have spent my money on it. Personally I like primers to be clear but this primer has so much colour to it that initially I thought they had accidentally put foundation in the tube. It's the shade of a mid toned foundation so I was a little concerned about putting this on my fair skin, however once applied I did find the shade didn't actually alter the colour of my skin... it was all very bizarre. So I guess thats not necessarily a reason to be put off but what I disliked about this was the application, I found that it dragged on the skin and did that annoying thing where it starts to ball up the more you try to blend it in. I like a primer to give a hydrated, moisturised base to work with and I didn't find it to do that however the longevity of my foundation with this was good. Luckily, the Stay Time Up To 25 Hour Foundation is a product I have fallen head over heels in love with. Ok, you need to forgive it for its slightly silly name- who actually needs to wear foundation for up to 25 hours?! But the 'stay time' part is completely accurate. I got the shade Porcelain which is a pretty decent match but for me this foundation is all about the finish and the longevity. I'm an oily skinned gal (with a few random dry patches) and I found that this left a beautiful matte finish to the skin but also didn't cake up and cling onto the dry patches. Throughout the day this doesn't need much powdering at all so once its on it requires minimal maintenance. It is quite a thick consistency and full coverage so if thats not your thing I wouldn't recommend it but if it is your thing then you honestly can't go wrong with this for £6.49. It makes my skin looks absolutely flawless and covered up a few pesky lurkers, I did still need a little concealer but I could have got away without it. On the whole I was just super impressed with this and so pleased to have found it. I picked up the Stay Time Concealer a couple of days ago, which again I have heard good things about, so I'll keep you posted on what I think of that too. I feel a little guilty that I have never really paid much attention to the Seventeen display in Boots before but after finding this gem of a foundation I will definetely be having a look there more regularly. Have you tried anything from the Seventeen Stay Time range? What did you think?